Hillary Clinton has continued to build the lead she has long held over Donald Trump since he became mired in sexual harassment scandals just over a week ago. 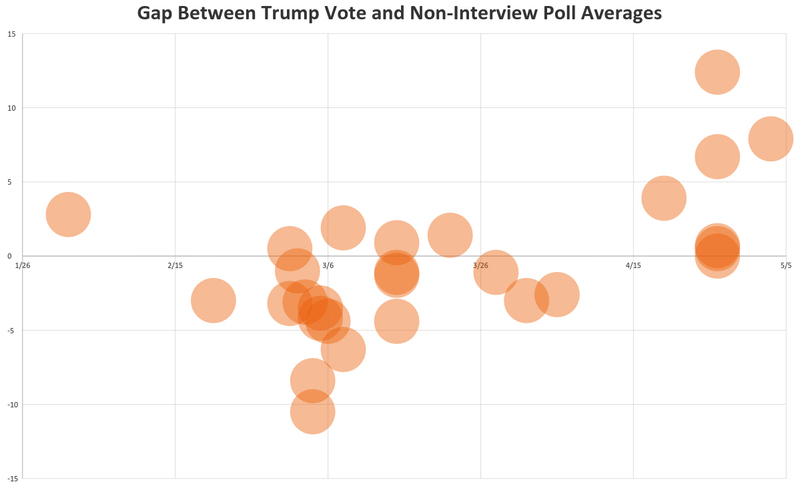 The data trend lines clearly seem to be having an effect on the polling-obsessed Trump, who is becoming increasingly erratic on the campaign trail and ratcheting up his rhetoric by promising to jail his opponent and frequently claiming that the election is “rigged” against him. Throughout the race, Trump fans have been clinging to the daily tracking survey sponsored by the University of Southern California and the Los Angeles Times, which has been more favorable to the short-fingered billionaire. The data discrepancy is primarily a rehash of a dispute from the 2012 election, when most national and state surveys consistently showed President Barack Obama ahead of his Republican challenger, Mitt Romney. These polls were “skewed,” according to their right-leaning critics because they relied on sample sizes that allegedly featured too many Democrats as compared with Republicans — and they could easily be “corrected” by adjusting the sample according to completely arbitrary and unscientific methodology invented by the now-infamous poll truthers. This time around, cranks like Dean Chambers of the infamous "Unskewed Polls" site (now somehow turned into a spammy German-language website about women’s fashion) have been mostly relegated to obscure alt-right websites and occasional segments with bitter Fox News pundits who refuse to listen to colleagues who have actually learned from their mistakes. What might have been this year’s hub for data denial — a shady website called LongRoom that briefly provided “unbiased” polling averages, without disclosing how they were derived — suddenly disappeared after FiveThirtyEight tried to find out who its operators were. Despite that sideshow, the sampling methods used by polling companies make a legitimate topic of discussion. It's a fact that sometimes pollsters do get it wrong. In the 2012 election, the RealClearPolitics polling average predicted that President Obama would win by less than 1 percent of the vote. He ended up defeating Romney by nearly 4 percent. To some degree, the sampling debate is more important this year than it was in 2012, since neither Obama nor Romney were unknown quantities the way political rookie Donald Trump is. One of his campaign’s fundamental premises is that Republican presidential candidates have done too poor of a job persuading white voters without college degrees to vote for them. That was also a constant refrain of his most significant rival for the GOP nomination, Sen. Ted Cruz, who phrased his argument more in terms of restive white evangelicals who wouldn’t vote for anyone but a full-scale Christian nationalist. During the primary season, a lot of discussion ensued about how telephone surveys that featured an actual person asking the questions were less likely to find support for Trump than surveys that relied on robocalls or online data collection. While this disparity did seem to exist in some cases, it didn’t really affect the vote totals at the state level, as FiveThirtyEight’s Harry Enten found, or at the national level, as The New York Times’ Nate Cohn has written. In fact, an analysis I conducted, based on Enten’s data, shows that until Trump’s late April victories in Northeastern states, he performed 3 percentage points worse than non-interview polls predicted he would in primary states. See the graph below; click to expand it. So at least during the primary season, it seemed evident that Trump supporters were not likely to lie to the pollsters. It’s possible that things could change for the general election, since not nearly as many people vote in primaries and caucuses. For instance, 19 million people turned out for the 2012 GOP nomination race whereas Mitt Romney received nearly 61 million votes in November. Many states also don’t allow people who aren’t registered members of a party to vote in primary elections, so there certainly could be people who wanted to vote for Trump’s nomination but couldn’t. It is also true that there are tens of millions of blue-collar or retired white people who generally don’t vote — and mostly aren’t registered to vote. That means there’s at least a theoretical possibility that there might be a large enough number of people willing to vote for Trump in his race against Hillary Clinton who weren’t interested in helping him out against his Republican opponents. The “missing white voters” are indeed out there, but they don’t appear to be registering to vote this time around. Even if they did, however, most of them appear to live in safe states that either Republicans or Democrats tend to carry by large margins, such as Illinois, West Virginia, Utah and Connecticut. Even worse for Trump’s prospects is the fact that he hasn’t really spent his campaign money on building a complex infrastructure similar to the one that Obama built in 2008 to identify new voters via data analysis and then get them to the polls with an extensive network of field offices. Even if Trump had made such turnout and data investments, however, it’s quite likely that the people he needs to bridge the growing gap between himself and Clinton aren’t inclined to support him. Despite his self-styled reputation as a “blue-collar billionaire,” Trump’s primary voters were wealthier than most Americans, on average, and wealthier than people who voted for either Clinton or Sen. Bernie Sanders. That fact is particularly relevant in light of a fascinating but little-noticed poll conducted in 2012 by Suffolk University of what the survey called “unlikely voters,” people who were either not registered or who said they weren’t likely to vote that year. According to the study, just 14 percent of unregistered people said they favored that year’s GOP nominee, Romney. Forty-three percent of them favored re-electing Obama, and 55 percent said they approved of his performance in office. Anything can happen between now and Nov. 9, of course. But as of this writing, it doesn't look like the disengaged people that Trump needs to win the election are interested in turning out on his behalf.